With countless questions left to be answered following the UFC’s controversial purchase of Strikeforce, very few conclusive responses were offered up during Mondays’ monumental, and somewhat awkward, joint conference call. Accompanying UFC president Dana White in the media powwow were UFC co-owner Lorenzo Fertitta and Strikeforce CEO Scott Coker. Unfortunately, not much new information was divulged outside of what White told Ariel Helwani on Saturday, or what was stated in today’s official press release. In fact, it was #BusinessAsUsual. Well, sort of. While White and Fertitta’s upbeat mood can be credited to their new toy, Coker appeared uncomfortable while addressing the media for the first time since the watershed announcement was made. The trio seemed to be sharing the same cheat-sheet during the conference call, as ‘We don’t really know right now, this thing just came together’ was constantly repeated throughout the 40-minute session. Coker suggests Silicon Valley Sports & Entertainment wanted out of the MMA business, but he wanted to continue and that’s why the sale went down. 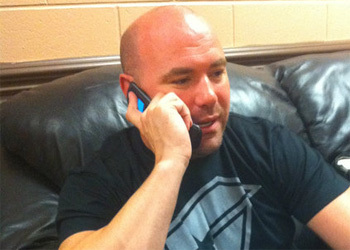 Coker and Zuffa started talking about the deal in December 2010 – just two months prior to kicking off their highly anticipated Heavyweight Grand Prix. Showtime’s deal with Strikeforce could extend until 2014. JoshGross of ESPN immediately tweeted that information, “Doesn’t square with everything I’ve heard.” It was first reported their Showtime contract would expire in about 2 years. Fertitta said the UFC has yet to meet with Showtime execs. They are open to promoting cards on Showtime and CBS, but haven’t had serious talks yet. Fertitta said antitrust lawsuits aren’t a concern. Strikeforce will still fight inside of a Hexagon and UFC athletes will continue to compete in an Octagon. However, Strikeforce will enforce unified MMA rules now. Meaning … ELBOW SHOTS ON THE GROUND FOR ALL STRIKEFORCE FIGHTS!!! White on Paul Daley and Josh Barnett: We can still do business. Coker runs everything over there, they don’t have to deal with me. Coker estimated there are roughly 140 Strikeforce fighters currently under contract. White jokingly stated he won’t counter-program against Coker anymore. Coker does not own a percentage of Zuffa, LLC. White: A Fighters Union is up to the fighters. This is not a team sport, people have different motives and needs. Will some of the superstars want to kick down money to wannabes? Fertitta ended things by emphasizing the UFC’s continued desire to penetrate more countries.